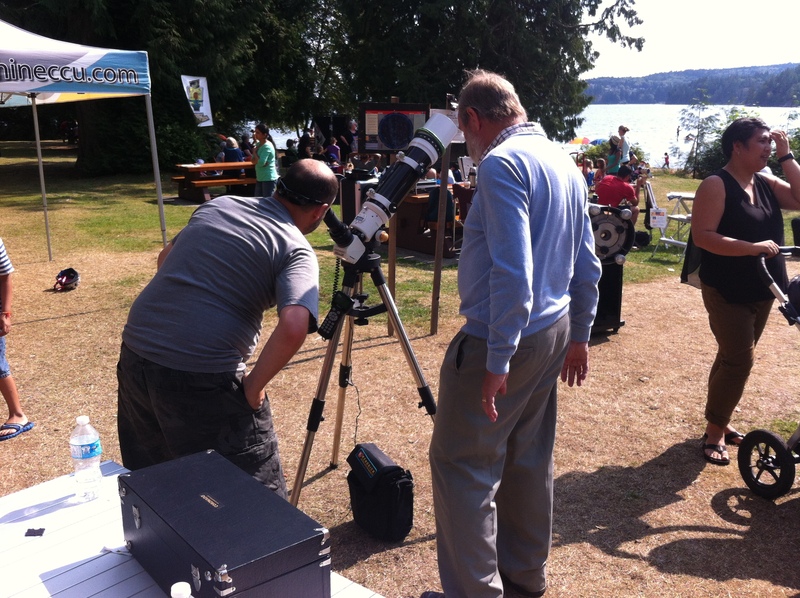 Bring the family and join the Sunshine Coast Centre of the Royal Astronomical Society of Canada for Astronomy in the Park on Saturday, Aug. 15th, from 1 to 11:30 p.m. at Porpoise Bay Provincial Park in Sechelt. There will be club telescopes, an information booth with membership information, displays and astronomy related giveaways. There will be an ongoing astro-crafts and colouring table for the kids and at 3:30 pm the Driftwood Players Story Theatre will weave their magical fairy tales. 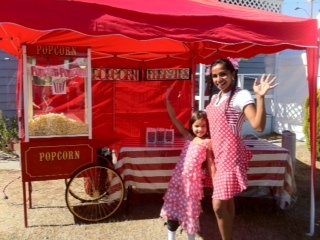 Julie Davis’ Fun Popcorn will be there selling popcorn and no byproduct hotdogs. Take in the popular multi-media presentation in the park amphitheatre at dusk, and afterwards, viewing through club telescopes in the park picnic area. With clear skies and a new moon, participants should be able to see constellations, star clusters and nebulae. It’s the best show on earth and it’s absolutely free. The Festival is a free, family event open to the public, organized by volunteers, and made possible by Porpoise Bay Provincial Park. Please respect all park rules. Weather permitting. 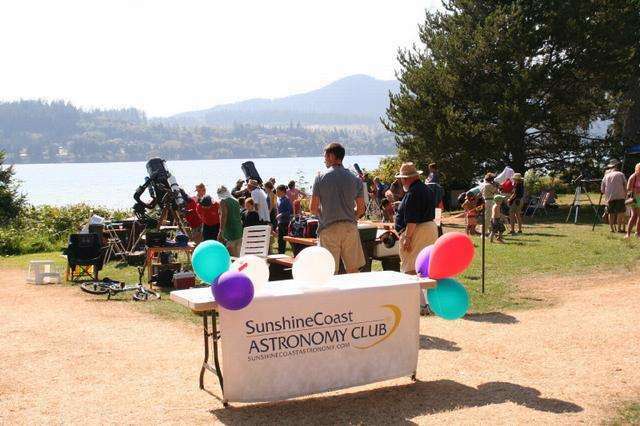 Also check our Facebook page Sunshine-Coast-Astronomy-Club (see link in the left sidebar of this site) . Comments: This is our eleventh annual club star party at porpoise bay park. 430 people viewed the skies through our telescopes last year. However, due to the Provincial Government charging us a $100 fee to put on this event, this may be our last Astronomy in the Park, as we are a non profit with limited funds. We had clouds when we showed up at noon to set up but in a few hours they cleared and we had 229 people view sun spots and solar flares through our solar scopes. Children’s Story Theatre had a good crowd of children for their performance. The amphitheatre was packed for the audio visual presentation at dusk and afterwards there were long lineups for the telescopes to view the night skies. Check out our photos of this event. 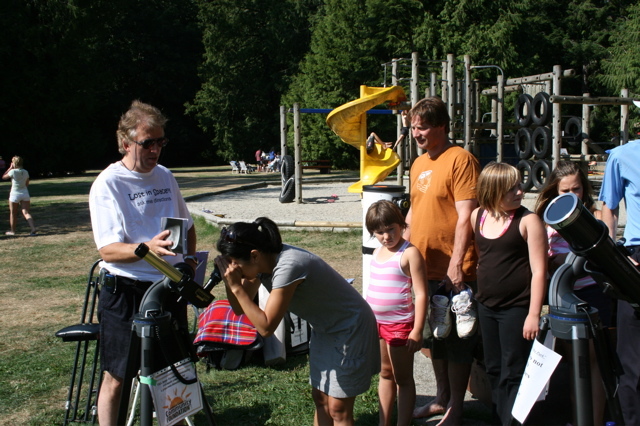 Bring the family and join the Sunshine Coast Centre of the Royal Astronomical Society for Astronomy in the Park on Saturday, Aug. 16th, from 1 to 11:30 p.m. at Porpoise Bay Provincial Park in Sechelt. There will be club telescopes, an information booth with membership information, displays and astronomy related giveaways. There will be an ongoing astro-crafts and colouring table for the kids and at 3:30 pm the Driftwood Players Story Theatre will weave their magical fairy tales. Take in the popular multi-media presentation in the park amphitheatre at dusk, and afterwards, viewing through club telescopes in the park picnic area. With clear skies, participants should be able to see constellations, star clusters and nebulae. It’s the best show on earth and it’s absolutely free. Our first Astronomy in the Park. This is an event that our Centre has been involved yearly with since 2005. Check out the photo galleries of past events on our Photo Galleries page. you can sleep at home, not on the ground. 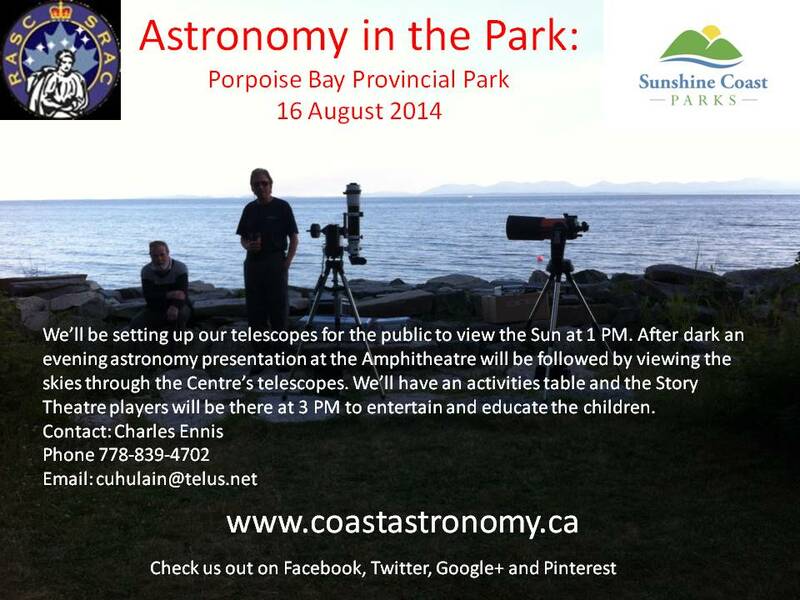 Comments: This is our tenth annual club star party at porpoise bay park. Attendance over 200. Also don’t forget we traditionally have our clubs summer wrap up bbq the next day for members only… stay tuned for more!